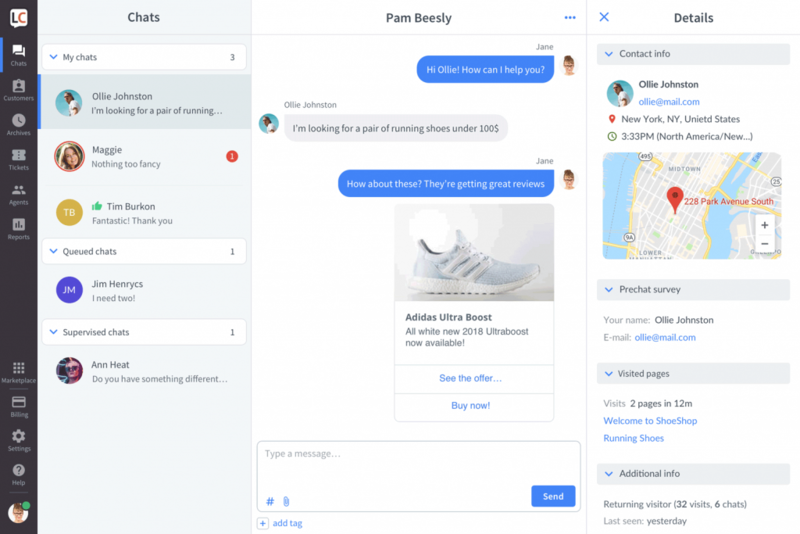 Chats section is where the communication between agents and customers happens. Here you can provide round the clock support and boost sales by converting people who are casually browsing your website into customers. LiveChat provides quite a few tools that help with handling chats effectively. Below, you can find a rundown of the most important features and options available in the Chats section. The chat list is divided into three sections: my chats (all of your ongoing conversations), queued chats (customers who are waiting to start a chat) and supervised chats (conversations you are currently supervising). A list of your ongoing chats. You can switch between them by clicking on the names of customers. We will let you know that you received a new message through in-browser notifications. Note that inactive chats don’t count into the concurrent chats limit; so if a chat becomes active again you might end up with more chats than your set limit. Visitors who are waiting for an available agent. If you have some free time on your hands just pick a customer from the list to start a conversation. Chats that are currently handled by other agents in your account, you can pick which chats you want to supervise in the Customer section. To help your teammates without going over to their desk, you can send them a message in chat that is invisible to the customer. To handle several chats at the same time efficiently, you need to keep switching between them. Your visitors don’t know that you are chatting with more than one person and could get impatient if you don’t respond for a long time. You can also switch between chats using keyboard shortcuts. This is where the actual conversation takes place, aka the heart and soul of our app. In the history of your chat, you can see both the messages that were sent during the current conversation and messages that were sent before (providing the person you are talking to hasn’t cleared cookies since your last conversation). To send a message, just type in your answer and press enter. We give your visitors a heads up that you are typing something so they know they need to wait for your reply. Once you press enter, your message will be sent to the visitor. And you will see it in the chat history. Tip: Make sure you keep your messages short and informative and give your customers some time to read your message before sending the next one. Message sneak-peek, lets you see what the visitor is typing before they send it over. This allows you to start thinking of the answer faster, making your responses quicker. Canned responses are predefined messages that can store a large portion of text to be later recalled with shortcuts. To use canned responses in chats or tickets, simply type in # followed by the shortcut for the response you wish to use. Learn how to create canned responses and more about their benefits in the canned responses tutorial. Use tags to categorize chats and easily find all conversations that deal with the same issue later on. Tags can be added and edited in Settings. You can send and receive files over chats using the file sharing option. Use it to pass all kinds of documents, for example, marketing materials, product catalogs, and guides. Click on the paperclip icon in the bottom left corner. Choose a file you want to send and click on Open. To finalize click on Send. Chat transfers allow you to transfer a chat to another agent or a group. Whenever you are making a chat transfer, let the customer and the other agent know what you are planning to do (and why). If you are on the receiving end of a chat transfer, let the customer know that he or she doesn’t need to explain the situation again (as you can see the chat history). Sometimes one conversation isn’t enough to solve a customer’s problem. This is where tickets come in handy. You can create them right from a chat – that way the transcript from the conversation will be included. Click on the three dots “…” icon in the top right corner. That’s it! You can head to the Tickets section to assign a person responsible, add new information, edit it’s status etc. Unfortunately, sometimes you need to ban a visitor that e.g. sends spam or uses abusive language. We are big fans of conflict resolution but sometimes you’ve gotta do what you’ve gotta do. That’s it. You can see the list of all the banned visitors in Settings. If you made a mistake, you can always unban visitors. Once you respond to all the questions or solve all your visitor’s problems, you can close the chat. There are actually two ways to close a chat: from the chat list and from the chat feed. Here you can find a lot of useful information about the customer you are talking to. Use it to provide more personalized support. Technology – user’s device information. 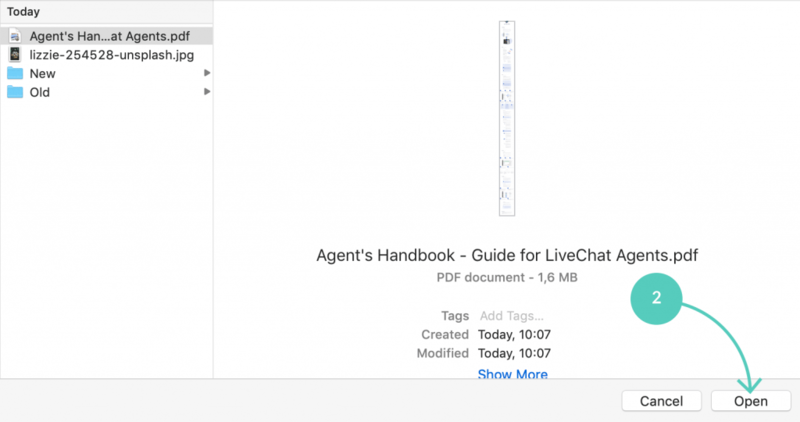 LiveChat can be integrated with a number of helpful third-party apps. They range from CMS platforms to desktop sharing apps. You can find and install them in Marketplace. Integrations can be used right in the Chats section – once installed, you will find them at the top of the Customer details tab.